DUBAI, United Arab Emirates -- The CIA's release of documents seized during the 2011 raid that killed al Qaeda leader Osama bin Laden has again raised questions about Iran's support of the extremist network leading up to the Sept. 11 terror attacks. U.S. intelligence officials and prosecutors have long said Iran formed loose ties to the terror organization from 1991 on, something noted in a 19-page report in Arabic that was included in the release of some 47,000 other documents by the CIA. For its part, Iran has long denied any involvement with al Qaeda. However, the report included in the CIA document dump shows how bin Laden, a Sunni extremist from Iran's archrival Saudi Arabia, could look across the Muslim world's religious divide to partner with the Mideast's Shiite power to target his ultimate enemy, the United States. "Anyone who wants to strike America, Iran is ready to support him and help him with their frank and clear rhetoric," the report reads. The Associated Press examined a copy of the report released by the Long War Journal, a publication backed by the Washington-based Foundation for Defense of Democracies, a think tank fiercely critical of Iran and skeptical of its nuclear deal with world powers. The CIA gave the Long War Journal early access to the material. The material also included never-before-seen video of bin Laden's son Hamza, who may be groomed to take over al Qaeda, getting married. It offers the first public look at Hamza bin Laden as an adult. Until now, the public has only seen childhood pictures of him. 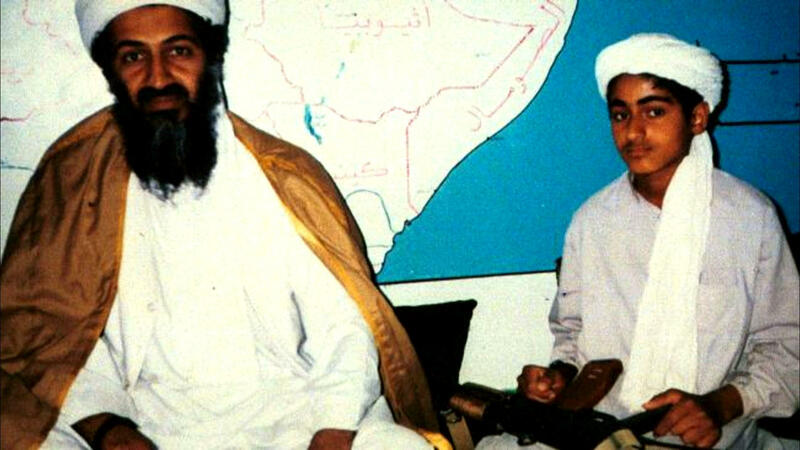 Hamza bin Laden, son of Osama bin Laden, in a still from video of his wedding. The video was found in a trove of files seized during the 2011 raid that killed the al Qaeda leader at his compound in Pakistan, and was released by the CIA in 2017. The release comes as President Donald Trump has refused to recertify Iran's nuclear deal with world powers and faces domestic pressure at home over investigations into Russian interference in the 2016 election. "We're not done with the bin Ladens yet." The 19-page report included in the CIA release was available online Wednesday. The CIA later issued a warning about the files on its website, saying that since the material "was seized from a terrorist organization ... there is no absolute guarantee that all malware has been removed." The CIA then took down the files entirely early Thursday, saying they were "temporarily unavailable pending resolution of a technical issue." "We are working to make the material available again as soon as possible," the CIA said. The unsigned 19-page report is dated in the Islamic calendar year 1428 - 2007 - and offers what appears to be a history of al Qaeda's relationship with Iran. It says Iran offered al Qaeda fighters "money and arms and everything they need, and offered them training in Hezbollah camps in Lebanon, in return for striking American interests in Saudi Arabia." This coincides with an account offered by the U.S. government's 9/11 Commission, which said Iranian officials met with al Qaeda leaders in Sudan in either 1991 or early 1992. The commission said al Qaeda militants later received training in Lebanon from the Shiite militant group Hezbollah, which Iran backs to this day. U.S. prosecutors also said al Qaeda had the backing of Iran and Hezbollah in their 1998 indictment of bin Laden following the al Qaeda truck bombings of the U.S. Embassies in Kenya and Tanzania that killed 224 people, including 12 Americans. Al Qaeda's apparent siding with Iran may seem surprising today, given the enmity Sunni extremists like those of the Islamic State of Iraq and Syria (ISIS) have for Shiites. But bin Laden had run out of options by 1991 -- the one-time fighter against the Soviets in Afghanistan had fallen out with Saudi Arabia over his opposition to the ultraconservative kingdom hosting U.S. troops during the Gulf War. Meanwhile, Iran had become increasingly nervous about America's growing military expansion in the Mideast. "The relationship between al Qaeda and Iran demonstrated that the Sunni-Shiite divisions did not necessarily pose an insurmountable barrier to cooperation in terrorist operations," the 9/11 Commission report would later say. Before the Sept. 11, 2001, attacks on New York's World Trade Center and the Pentagon in Washington, Iran would allow al Qaeda militants to pass through its borders without receiving stamps in their passports or with visas gotten ahead of time at its consulate in Karachi, Pakistan, according to the 19-page report. That helped the organization's Saudi members avoid suspicion. They also had contact with Iranian intelligence agents, according to the report. This also matches with U.S. knowledge. Eight of the 10 so-called "muscle" hijackers on Sept. 11 -- those who kept passengers under control on the hijacked flights -- passed through Iran before arriving in the United States, according to the 9/11 Commission. However, the commission "found no evidence that Iran or Hezbollah was aware of the planning for what later became the 9/11 attack." For its part, Iran has denied having any relationship with al Qaeda since the 1998 attacks on the embassies. Iran quietly offered the U.S. assistance after the Sept. 11 attacks, though relations would sour following President George W. Bush naming it to his "axis of evil" in 2002. On Thursday, Iran's semi-official Fars news agency, which is close to the hard-line paramilitary Revolutionary Guard, dismissed the CIA documents as "a project against Tehran." The 19-page report describes Iranians later putting al Qaeda leaders and members under house arrest sometime after the Sept. 11 attacks. It mentions the 2003 U.S.-led invasion of Iraq, saying it put increasing pressure on Iran, especially with the rise of al Qaeda in Iraq. "They decided to keep our brothers as a card," the report said. That would come true in in 2015 as Iran reportedly exchanged some al Qaeda leaders for one of its diplomats held in Yemen by the terror group's local branch. While Yemen described it as a captive exchange, Tehran instead called it a "difficult and complicated" special operation to secure the Iranian diplomat's freedom from the "hands of terrorists." "The repercussions ... of the Sept. 11 attacks were undoubtedly very large and perhaps above (our) imagination," the al Qaeda report said.